Gremlins are supernatural creatures to whom mechanical malfunctions are attributed. During World War II air force pilots often blamed such technical difficulties on sabotage from the Gremlins. They were attributed a large number of disruptive abilities, such as the ability to siphon off fuel, cause instruments to give false readings, or raise and lower the runway by ten feet. 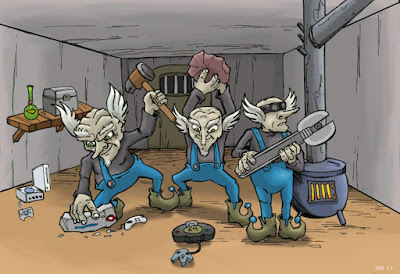 I imagine that modern gremlins have probably gone on to destroy and dismantle the wide variety of computers, video game systems, and other types of consumer electronics.